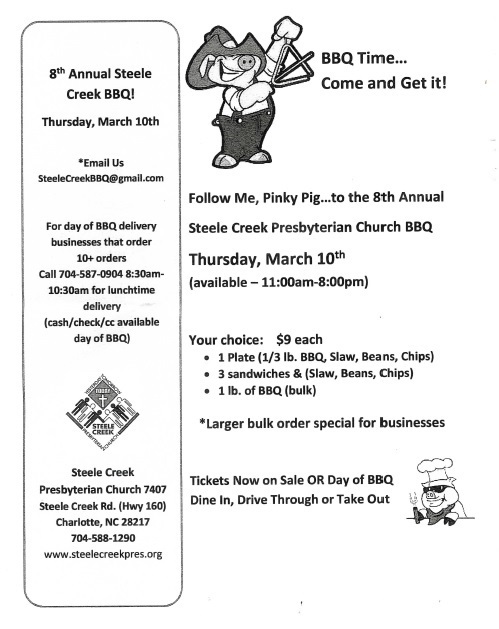 (March 8, 2016) Steele Creek Presbyterian Church will be holding its 8th annual BBQ on Thursday, March 10. BBQ will be available from 11:00 AM to 8:00 PM. 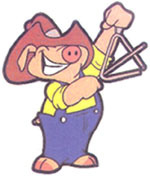 For lunchtime delivery of 10 or more orders, call 704-587-0904 from 8:30 to 10:30 AM on the day of the BBQ. Ask about large bulk order specials for businesses. Cash, check or credit card payment is accepted on the day of the BBQ. Tickets are on sale now or on the day of the BBQ. Dine in, drive through, and take out will be available. Steele Creek Presbyterian Church is located at 7407 Steele Creek Rd. (Highway 160) just south of the airport.